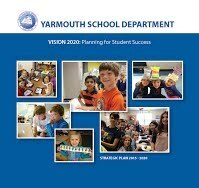 In May, 2015, the School Committee approved the work of the Strategic Planning Team, resulting in adoption of " Vision 2020: Planning for Student Success", a five-year plan for the Yarmouth Schools. We invite you to read through this document to see what we will be working on between now and the end of the 2020 school year. Each year, the Superintendent of Schools will update the School Committee as to the district's progress toward meeting the goals of Vision 2020. Updates will be posted here for public review.